the small guide site's blog of English lessons: Do you prefer dawn or dusk? 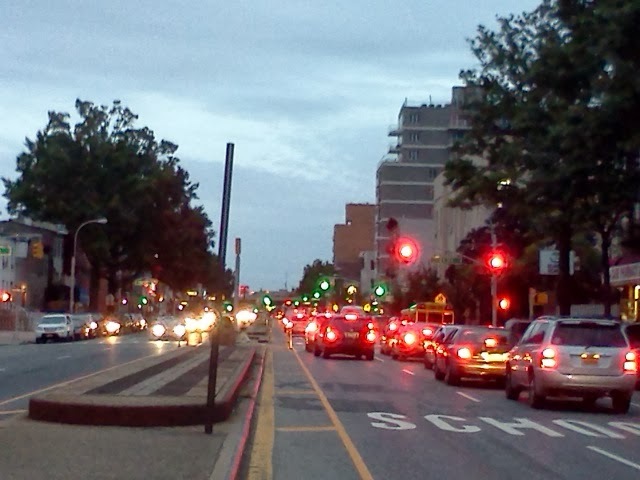 Cars heading home in the twilight in Sunset Park, Brooklyn. I stepped out for a short walk the other day at dusk to grab a couple slices of pizza and was reminded of how much I love this time of day. It's called twilight, the short period when the sun is already below the horizon after sunset and just before dark. The word "twilight" can also refer to the quality of the light at this time and actually has a poetic ring to it. As such, it's more common in writing, especially in storytelling, than in speaking. We also use this word to talk about the early morning hours of dawn; however, it is used more to refer to nightfall. I actually prefer dusk compared to dawn. Why? Well, I love the twilight and the way man-made, electric lights glow in combination with the waning daylight just before darkness settles in for the night. I think it's magical and has a spiritual quality to it. After you read this post, I invite you to stop by another blog that I keep, where I end up writing about dusk and where I wax poetic about my love for this time of day. I decided to write this post and the vocabulary words above because I've realized that some English learners are familiar with the word dawn but have never encountered the word dusk or twilight. If you know the word sunrise, you should know sunset, right? Dusk is simply the opposite of dawn. To talk about dawn, you can also use "at daybreak" or the phrase "at the break of day." Similarly, to talk about dusk, you can also say "at nightfall." So which do you prefer? Do you prefer the dawn at the break of day or, like me, the magic of twilight at nightfall? I hope you enjoyed this post and learned something. Spread the word if you know other English learners who might benefit from the small English blog. You can use the buttons below. Also, urge (encourage) them to LIKE the small guide site on Facebook and to follow me on Twitter @joeyu2nd. Thanks, and take care!